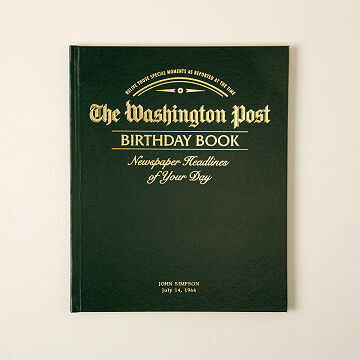 A handsome collection of The Washington Post front pages, one for each birthday in your recipient's life. It's time to celebrate a great moment in history--the day you were born! This custom-made, commemorative book is a treasury of the historic events that have crossed the path of you or an honored gift recipient. To start with, the timeless, hardback binding comes with the recipient's name embossed in gold on its surface, as well as a custom-printed dedication on the title page. Inside, the book contains reproductions of the front page of The Washington Post, one for each birthday all the way back to the day you entered the world. Leafing through the pages gives a time-lapse view of a lifetime of history, from world events and global leaders, to changing technology and fashions. Opposite from each headline page is a page with room for the recipient to write his or her own personal experience of that year, along with photos and other mementos. It"s a beautiful tribute that transforms the ephemeral matter of yesterday's news into something that will be treasured for years--or generations--to come. Made in the United Kingdom. Please note: Certain years/pages are reprinted from microfilm and font sized may be reduced. New pages may not be available for inclusion for up to 6 months after the date of print. Missing pages may be the result of a newspaper strike or a lack of relevant information on the front page for that date. This turned out to be a really great gift for my mom. At 91 she has everything she needs and it's really difficult to find something unique. She is thoroughly enjoying every page. The print is small so you may need the magnifying glass option. It is very nicely done with her name and birthdate embossed on the front with a dedication on the beginning page. Great gift for history buff that likes history geared toward them. This was the perfect gift for my bookworm/history nerd wife. The text was clear and legible. The current affairs of each of her birthdays are an interesting glimpse into everyday life of bygone years. Some of the things that were of front-page importance long ago know seem trivial, giving important perspective on today's news. Perfect gift for my husband who grew up reading this paper! I bought this for my brother for Christmas. I can't wait to give it to him! Beautiful book! I gave it to my husband early because I was excited about it and I knew he would be too. Can't think of anything I don't like about this. Hope my grandfather likes it just as much! Combined Xmas and Bday gift!! Someone gave this to my father for his 80th and it was a smash!! Being tired of the same ol' bottle of wine and restaurant GC, I recommended we give this book to my boss as a combined Birthday/Xmas gift. We included a magnifying glass since the print is rather small. It was a thoughtful gift and a huge success. Would definitely purchase again. This is quite an impressive gift. We gave this as a 70 th birthday present and everyone loved paging through it. The print is small for even young eyes so we did also get a magnifying glass to go along with it. The fact that it is personalized with their name and a message makes this a thoughtful and unique gift. The Washington Post Custom Birthday Book has a 20 page minimum, so only dates prior to today's date in 1998 or earlier can be ordered at this time. The most current date available is the date on which you place your order.